Type Effectiveness refers to how strong or weak a Type of Move is when used against a certain Type of Pokémon. If a Move is strong it will deal increased damage, also known as Super Effective. On the other hand, if a Move is weak it will deal reduced damage, also known as Not Very Effective. Choosing the right Type of Move(s) is critical during battle. This is especially true if both Pokémon happen to have similar levels of CP and HP. In an even matchup, Type Effectiveness can play a very important part in determining the winner and the loser. For example, let's say a Pikachu (Electric Type Pokemon) is battling against a Poliwag (Water Type Pokemon) and both have equal Combat Points and HP. Pikachu continues to use Thunderbolt throughout the battle. Being that Thunderbolt is an Electric Type Move it will continue doing extra damage to Poliwag as Electric is Super Effective against Water Types. Poliwag uses Bubble (Water Type Move) throughout the battle. 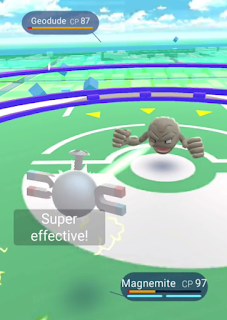 This move will deal normal damage to the Pikachu as there is no Type advantage when it comes to Water Moves vs. Electric Type Pokémon. Assuming that Dodge is a non-factor in this battle (or both Pokémon Dodge an equal number of attacks) Pikachu will have dealt more damage overall, giving it the distinct advantage. Also assuming that there are no critical hits landed by either Pokémon Pikachu will win this battle the majority of the time. - Know the Type and Moveset Types of your opponent. - Use Pokémon that have a Fast Move and a Charge Move of different Types. For example, Charizard may have Wing Attack as its Fast move and Flame Burst as its Charge Move. This moveset would consist of one Flying Type Move and one Fire Type Move. - Having different Types of Moves will give your Pokémon an advantage against a wider range of opponents. - Understand the strengths and weaknesses of every Type of Move and every Type of Pokémon in order to choose battles wisely. Is there any quantitative measurement on how effective a super effective move is when compares to a normal move? 2 times more damage? 1.5 times? Or 1.25 times?